Artists: Bordalo II, Andre Saraiva, RETNA, Joakim Ojanen, Saddo, Egle Zvirblyte, Lakwena, Sebastian Velasco & Luke Pelletier. 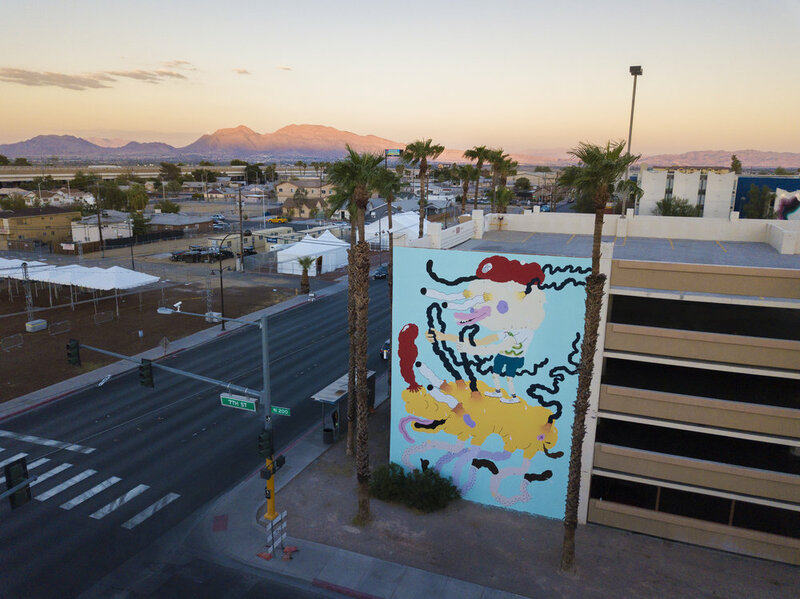 Wrapping up the sixth edition, JUSTKIDS teamed up with Life is Beautiful Music & Art Festival to greet attendees and the Downtown Las Vegas community with brand new multi-media art pieces from some of the most notable international artists & installation makers around the globe. Blurring the lines between visual and experiential art, festival-goers enjoyed an immersive visual experience within 18 city blocks, far-beyond the traditional festival art programming. Unruffled by the intense heat of las Vegas summer, the JUSTKIDS 100% female team worked nights and days during 4 weeks to produce larger-than-life wall installations and murals from diverse artists, including Bordalo II, Andre Saraiva, RETNA, Joakim Ojanen, Saddo, Egle Zvirblyte, Lakwena, Sebastian Velasco & Luke Pelletier.